The next European Ryder Cup side looks a difficult one to predict but, even so, there are a few names everyone expects to see on the team sheet. Questions surround the participation of many of the old guard with so much young talent around, but there appear four certainties to retain their places: Rory McIlroy, Justin Rose, Henrik Stenson and Sergio Garcia. This quartet remain in the upper echelons of the world rankings and have been regulars during Europe's recent, unprecedented run of success. There is little to suggest they won't form the engine room for the continent's trophy defence at Hazeltine this autumn. But for all four, the Ryder Cup only becomes a priority when we get to September and head towards the Minnesota match. Before then there are big individual goals to be satisfied. McIlroy and Rose aim to add to their major tallies and Stenson and Garcia seek to break their ducks in the four biggest tournaments. It is extraordinary to think that Garcia has now turned 36 and is still waiting. Remember the callow, precocious bundle of energy who ran Tiger Woods so close on his US PGA Championship debut back in 1999? Last week the Spaniard began his 18th European Tour season in a windswept Qatar, where he finished in a reasonable share of seventh place. The highlight was a second-round 66 but, worryingly, his putting again failed to match the prowess of his long game. No-one finishing ahead of Garcia bettered his statistics tee to green but an average of 31.5 putts per round proved his undoing. By the final round the popular Spanish star was again experimenting with his putting grip, ditching the claw technique of recent seasons to go back to a more traditional method. "I just wanted to try something different," Garcia said. "Obviously I putt with a normal grip on the long putts, probably over 25, 30 feet. "But I just wanted to go the whole way because I haven't felt great this week with the claw. It actually worked better. I made some good putts. I was quite good and I was quite confident on the short ones." Garcia ended last year on an encouraging note, finishing fourth in Thailand and celebrating his 28th professional victory by prevailing in a four-way play-off at the inaugural Ho Tram Open in Vietnam. While such victories are wonderful for the bank balance, they do little to alleviate a sense of career under-achievement. Yes, Garcia has been a fixture in the world's top 10 almost his entire career, but his 2008 Players Championship remains the most notable success. How different the story would have been had he holed the 12-footer on the 72nd green at Carnoustie in 2007 that would have given him The Open. Instead he went into a play-off won by Padraig Harrington. The Irishman was again Garcia's nemesis the following year, beating him into second place at the US PGA at Oakland Hills and since then the Spaniard has failed to contend for an American major. Indeed, the impact of those disappointments contributed to a rankings slump that led to him missing the 2010 Ryder Cup. His commitment to the cause remained evident, though, as he turned up at Celtic Manor as one of Colin Montgomerie's vice-captains instead. Garcia was too talented to remain outside Europe's top dozen golfers for too long and reclaimed his place for the subsequent victories at Medinah and Gleneagles. Energised by the 2016 prospects of an eighth Ryder Cup and an Olympic debut, Garcia is approaching this year with enthusiasm and he is not giving up on his major dream either. "I guess every year that goes by, it feels another chance that has kind of gone by," he recently admitted. "But like I said, if I get to 45 and I haven't won any, then I will probably feel a lot of pressure then. But I still feel like I'm young enough to be able to do it, hopefully several times. "If I keep playing well, I'm still going to have a lot of majors to come, so a lot of opportunities are there for me. So we'll see." 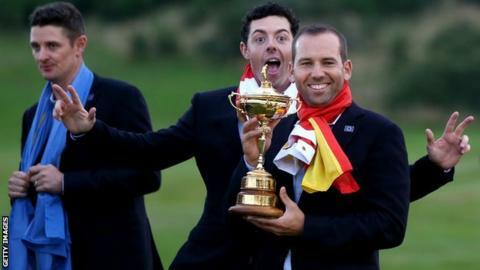 Garcia was once the young pretender with the game at his feet - the McIlroy, Jordan Spieth, Jason Day or Rickie Fowler of his day - but there is a production line of young talent emerging on both sides of the Atlantic, as well as in Asia, and uncomfortable as it may seem, Garcia must now be regarded as an old hand on the back nine of his career. "My appetite is the same," he insisted. "Obviously it's nice to see a lot of these young guys playing and playing well, because that means that the future of the game is in good hands. "I love playing golf, I enjoy every minute of it, and I try to push myself to become better every year, better and more consistent. That hasn't changed." That outlook can only be good news for Ryder Cup captain Darren Clarke and European golf in general. Despite so much young talent around, an in-form Garcia always enhances proceedings. His experience at Hazeltine could prove invaluable. And who knows? Maybe, if he can sort out how to hold his putter most profitably, this might just be his year.